Set beneath a range of steep hills on the southeastern coast of Lanzarote, Puerto del Carmen is one of the island's major holiday resorts and is very popular. The resort's main feature is a spectacular two-mile (3km) golden beach, which is backed by the main road, The Strip, where shops, bars and restaurants of every variety can be found. 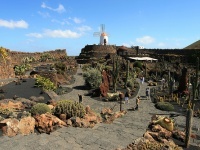 The Old Town retains some of its old-world charm but for the most part the resort of Puerto del Carmen is a sprawling holiday complex offering entertainment for all ages. It is the centre of Lanzarote's nightlife and boasts the highest concentration of bars and nightclubs of all the resorts on the island, making it the destination of choice for those wanting to party. Puerto del Carmen is within easy distance of all the island's key attractions, making excursions easy to arrange. Puerto del Carmen is stuffed with shops of all kinds, from duty-free electrical stores and stalls along The Strip targeting holidaymakers, to the excellent clothes shops and boutiques in the Old Town. The Sunday Market in Teguise is worth a visit: as well as the usual tourist tat and holiday souvenirs visitors will find a variety of locally produced goods from pottery to tablecloths. Puerto del Carmen is perhaps the best Lanzarote resort for shopping. There are hundreds of restaurants to suit all holidaymakers' tastes and wallets in Puerto del Carmen, the most popular including La Bottega Della Pasta, Casa Bodeco's, Bodega, and Chiquito. Most restaurants are on The Strip, serving everything from local cuisine to fast food, as well as Chinese, Mexican and Indian food. There are many fine restaurants near the harbour in the Old Town. Those wanting to get out of Puerto del Carmen for the evening can take a taxi to the old capital, Teguise. It has a lovely atmosphere in the evening and a few good restaurants. Puerto del Carmen is the main nightspot on the island and its population swells most evenings as tourists from other holiday resorts come to enjoy its bars and clubs. There are loads of good English, Irish and Scottish bars in the New Town along The Strip. The Centre Atlantico has a number of cocktail bars and can be a good spot to start the evening. The Hippodrome is also here but more serious clubbers may prefer Caesars. There are also several live music venues and karaoke bars, while the Star Bar provides great family entertainment. Holidaymakers can enjoy all sorts of water sports on the beach in Puerto del Carmen, from banana boat rides to jetskiing and sailing. Windsurfing is particularly good due to the strong regular winds. Deep-sea fishing is also excellent and can be arranged through a couple of operators. Scuba diving centres take trips to local wrecks as well as offering lessons. For land-lovers there is tennis and squash within the resort and golf and horse riding nearby. Boat trips go from the harbour and from Puerto Calero. 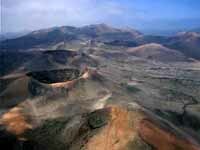 Further afield visitors can explore the dramatic landscape of the Timanfaya National Park. Most activities can be organised through the tour operator reps, though it is sometimes cheaper to book directly. Whilst water is safe for cleaning teeth and washing food, it is very high in mineral content and can cause bad stomachs. Bottled water should be used for drinking. There are lots of people trying to sell tourists everything from trinkets to timeshare apartments; if you are not interested avoid getting into a conversation.